Tom Seaman (Nutcracker Racing) took his first senior cyclo-cross victory with a late attack on a technical section giving him enough of a gap for the win. Seaman, aged 16, was in the lead from the very start and was joined by Edwin Oliver-Evans (CX Magazine) who came off twice on the wooded technical descent but rejoined the lead on both occasions. 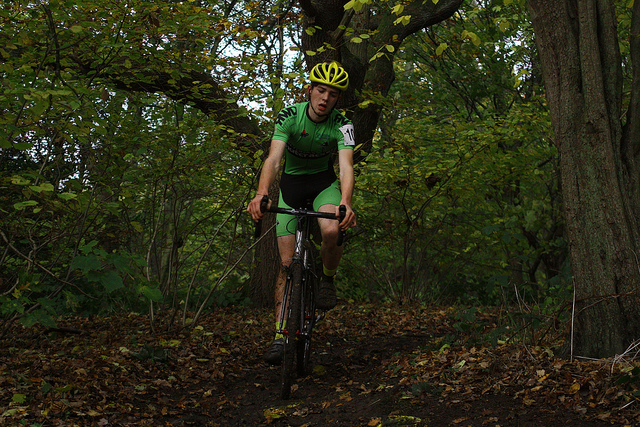 The two worked well together for the whole race until the final lap when Seaman used his mountain bike expertise to gap his opponent and ride to victory. This is Seaman’s first senior victory after taking three junior category wins already this season including one in the Rapha Super-Cross at Broughton Hall. Coming home in third place was Phil Hinchliffe (Bradford RCC), who was first Vet-40. The women’s prize went to Alison Kinloch (Ilkley CC). Ilkley CC were using for the first time the woodland and grassland surrounding the facilities at the well know Lido and cricket club just to the North of the town. The course included a well laid out lightly cambered parkland section before a very tricky climb and then two part descent through woodland. With two narrow bridges and a patch of sticky mud that nobody totally escaped, it was a severe test for everyone. The day began with the Youth race. Under-14 Eddie Townend went into an early lead but was then gradually pulled back by Dylan Flesher. The pair then rode together to the end of the race, where Flesher was the stronger, claiming the win. Townend took the Under-14 prize. Grace Feetham was the leading Youth girl and Annie Feetham was the leading under-14 . Attention then switched to the three under-12 races, with a remarkable 84 competitors lining up. The Under-8 winner was yet another of the Feetham clan, Alice, whilst Wil Lampkin was the leading boy in second place. The under-10 race saw Toby Kershaw continue his great run this season with another strong ride. Freya Brearley was the first girl home in 7th place. The Under-12 race saw Marcus Hiley see off the challenge of Nathan Page, whilst Olivia Ingham made it a Pedalsport CC clean sweep taking the girls’ race and sixth overall. The final race of the day was for novice adults. A good entry of 20 riders battled over a slightly eased version of the main course and Andy Stoneman was the winner, with Louise Williamson the leading woman in 7th place. Local hero Scott Thwaites was on hand to help with the prize giving and with the event having access to the excellent facilities at the venue, the atmosphere throughout was noisy and enthusiastic. Hopefully this venue will become a regular part of the YCCA calendar. With a large and committed team of marshals and over 250 riders entering the event, it was a credit to the host club and the event organiser, Kevin Barrett. My son Oscar is new to this and only just got round to looking at the results of this race. This the first race hes done, and hasn’t done anymore for various reasons… hes not listed? he raced in the U12??? It may be he didin’t finish his final lap or the chip timing missed him as happens occasionally.